Google has asked for feedback from the public on the EU Court of Justice ruling that there exists a right to be forgotten, and that the search engine should comply with reasonable requests for this in their search results. As reported in Search Engine Land by Barry Schwartz, Google is seeking the opinions of the public in relation to the issue. 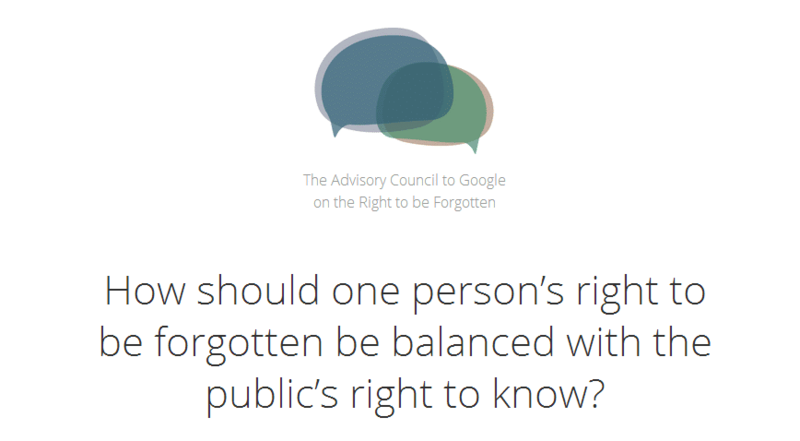 The primary question asked by Google is: How should one person’s right to be forgotten be balanced with the public’s right to know? On the form is space to leave name, email, profession, country, a box to leave an opinion, and two tick boxes: one asking if you want to stay in touch, and a second asking if it is okay for the message to be published. From this we can assume that as well as collecting opinions, Google is leaving open the possibility of both publishing the opinions on the web, and ultimately using the opinions for traction in any future interaction with the EU. The form is found on the Google Advisory Council website here. On the new website Google explains briefly an overview of the recent ruling and how they have started to deal with the issue. Since [the ruling], we’ve received removal requests on all sorts of content: serious criminal records, embarrassing photos, instances of online bullying and name-calling, decades-old allegations, negative press stories, and more. For each of these requests, we’re required to weigh, on a case-by-case basis, an individual’s right to be forgotten with the public’s right to know. We want to strike this balance right. This obligation is a new and difficult challenge for us, and we’re seeking advice on the principles Google ought to apply when making decisions on individual cases. That’s why we’re convening a council of experts. We’re just getting started, but during this process we also want to hear your input, too — this is all about your rights online, and the Internet provides an incredible forum for discussion and debate. On the Google Advisory Council committee is: Jimmy Wales, Eric Schmidt, Prof. Luciano Floridi, Sylvie Kauffmann, Lidia Kolucka-Zuk, Frank La Rue, José-Luis Piñar, Sabine Leutheusser-Schnarrenberger, Peggy Valcke and David C. Drummond. This week the UK Liberal Democrat Justice Minister Simon Hughes stated to a House of Lords select committee that in the governments opinion the ruling had created a system not unlike the censorship found in China. Hughes stated that in UK law people do not have the right be forgotten. There is essentially a greater public interest in individuals not having a right to remove embarrassing or old information about themselves. As the saying goes, trust, like reputation, is hard to earn, but easy to lose. What do you think about the new ruling and what is happening at Google? Leave a comment below.